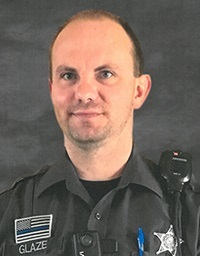 Deputy Sheriff Dan Thomas Glaze, Jr.
Reflections for Deputy Sheriff Dan Thomas Glaze, Jr.
On 02/27/18 I was on a traffic stop on US 131 in Kalamazoo County, MI. As I opened my door to re-enter my vehicle I glanced down and saw a rubber wristband on the ground with a blue line on it. I picked it up and it read "Sheriff Deputy Glaze 110." I did some research and learned of Glaze's line of duty death. I have reached out to local law enforcement in the area and will be sending a care package to Dep. Glaze's family. I want them to know his sacrifice will not be forgotten and that that wristband now hangs on my spotlight handle in my car as a sign that Dep. Glaze always has my six. Thank you for watching over me Dep. Glaze. RIP Brother, today my box, Crossfit Coal, is remembering your sacrifice to your community and our country. May your family find peace and comfort. I ran a hero's 5k in your honor today Sir..you are not forgotten. Time passes quickly, yet grief does not. Nearing this first anniversary of your End of Watch many memories can flood the heart. You and your family are in the hearts and on the minds of many. God's peace and speed Deputy Glaze. Thank you for your brave, dedicated service. RIP Brother. Rest in Peace Dan. It was an honor to know you and work along side you. We have the watch from here brother. Rest in Peace, Deputy Sheriff Dan Glaze. Thank you for your service to this country and your community. My thoughts and prayers are with your family and your department at this time. To the family of Deputy Sheriff Dan Glaze, friends, Sheriff Jeffery Wallace and the Rusk County Sheriff's Office. I have lifted you and your family to God every morning for over five years. Feel those prayers. God is with you; He knows and will ease your pain. The Durham County Sheriff's Office BLET Academy 38 sends its deepest condolences to your family and department. Rest In Peace. The Albany Police Academy sends its deepest condolences to the Glaze family and the Rusk County Sheriff's Department. Rest in Peace Deputy Dan Glaze. RIP brother. Thoughts and prayers to your family. Upper Chichester Twp P.D. PA. Your good work of keeping the streets safer will never be forgotten... Rest in peace brother!